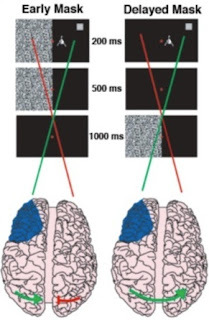 Oscillatory Thoughts: PLoS ONE paper: "Prefrontal Cortex Lesions Impair Object-Spatial Integration"
PLoS ONE paper: "Prefrontal Cortex Lesions Impair Object-Spatial Integration"
In this post I'll discuss the science behind my most recent paper in PLoS ONE, "Prefrontal Cortex Lesions Impair Object-Spatial Integration", as well as give a general update of my goings-on. But a lot was going on last year: new post-doc at UCSF, zombies, left and rejoined academia, new baby... so you'll forgive me, I hope, for having a small lapse in my publication record. Despite that lapse, you should expect several more updates about my research in the next few months. In fact, just this week I got word that another paper of mine was accepted for publication, I've got a third sent back to reviewers after a positive round of reviews, and two more waiting for co-author approvals before sending them off for publication. All of these are first- or senior-authored papers. Boom. Headshot. Bring it on, Science. Back to the paper of interest. The ability to navigate a complex visual world relies upon knowing both what an object is and where it is located. This capacity makes the difference between recognizing the red brake light on the motorcycle right in front of you from the red stoplight far ahead. Distinct ventral “what” and dorsal “where” pathways support object identification and location, nevertheless we are capable of seamlessly integrating object form with location information in a unified percept. Of course this what/where distinction may be overly simplistic, but the behavioral fact is that we do seamlessly integrate distinctly separate pieces of information and I find that fact fascinating. Even more, the means through which brain areas coordinate information transfer to perform this kind of integration is a central question in my research. A paper I've got coming out later this year tries to address that question from a neurophysiological perspective. But I'm getting ahead of myself. Back to the paper at hand. Here's the neat thing: we know that the frontal cortex communicates with the visual parts of the brain in the back. So our patients with lesions to their left frontal cortex should have deficits in object/spatial integration only when stimuli were presented to the right side of the screen. This is because when information is presented to the right side of the screen, it would normally enter the left visual cortex, and then get "sent up" to the prefrontal cortex which helps remember this information during a delay period when nothing is actually on the screen. But because of their specific damage to only one side of their prefrontal cortex, this deficit would only arise for stimuli shown on the right, and not on the left, for example. Which got us thinking. 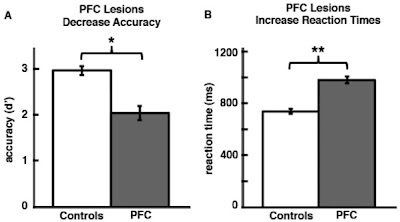 In my Neuron paper I showed how the intact prefrontal cortex helps compensate for the damaged side when the damaged half of the brain is challenged. Maybe there's something about this task, or task design, or this specific group of subjects, that makes this compensation easier or better. So here's the second bird with that one stone: we added some visual noise to our experiment. 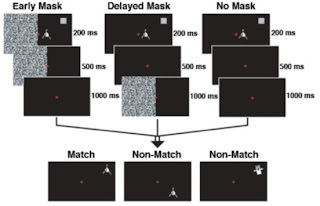 In the Neuron paper I argued that for compensation to occur, visual information must be transferred from the damaged half of the brain over to the undamaged half so the intact prefrontal cortex could process the task. This transfer probably happens across the corpus callosum back in the visual cortex. If this hypothesis is true, if we could somehow block that transfer, or at least make it noisier, we should once again see the deficit. In our experiment we included two kinds of masks: an early mask that adds noise during the critical time when the information should transfer; there was also a second, delayed mask that appears after the information should have transferred already. This served as a control to account for the distracting effects of the mask itself without actually adding noise to the information being transferred. Note that this wasn't a huge effect, and I actually ran some resampling statistics on the full dataset to try and confirm that was we found wasn't an artifact. 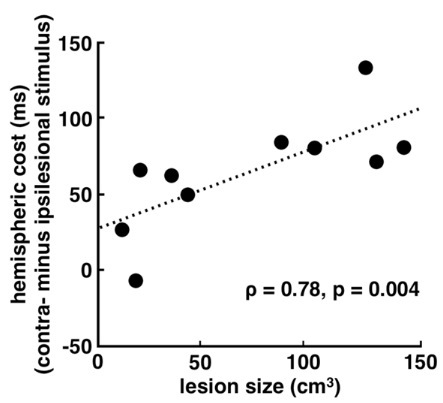 Nevertheless, the box and whisker plot on the left above shows that it's a pretty consistent effect within the patient group, with 9 out of the 10 patients showed the effect, and one patient just barely did not. More interesting is the fact that the patients with the biggest lesions showed the biggest effect. Correlations are always nice, right? They're sciencey. Okay, meta-science time for those of you out there just getting started out in the sciences: this paper was reviewed in a couple of "high profile" journals, but mainly because our hypothesized effect was weak it was rejected, despite some quite positive reviews. This was after a round of appeals because a reviewer at High Profile Journal actually referred to the d' metric we used to index "accuracy" as "opaque" and requested units on the associated axis in Figure 3 (d' is unitless). No bueno for such a common metric. This paper bounced around for years across 7 journals before we opted to work with PLoS ONE. I'm sorry I waited so long, because the experience there was great and the reviewers were thorough and conscientious. As always, I'm keeping track in my CV of how many times each paper I publish was rejected. My rejection count is getting impressive! It's a nice exercise, not only because it lets new-comers to science see how arduous and difficult each victory is, but also because it makes a little game out of getting rejected! The little things really do help with motivation sometimes. This will probably be my last stroke/recovery paper as first-author for a while, as I'm moving on to other systems of neuroplasticity for my post-doc. But I really love working with these patients, and this is a topic really near to my heart, so I'll most likely return to this work some day. But Bradley before you totally leave stroke /recovery you can combine it with neuroplasticity and see if neurons are good or evil. Do they request help from neighbors or do they become autocratic and just take them over? Nanowires could listen in on the conversations. How do you follow the scientific literature?